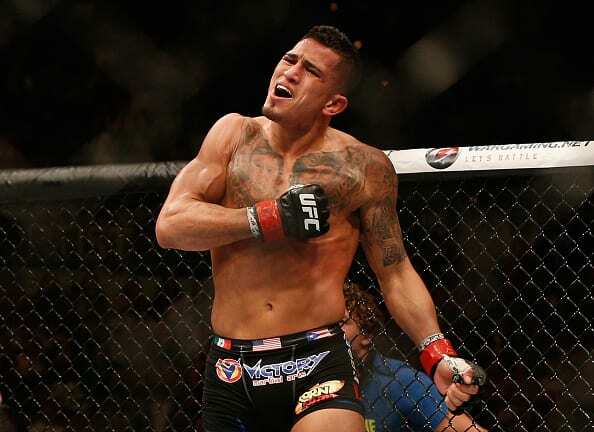 UFC Nashville‘s main event saw former lightweight champion Anthony Pettis face Stephen ‘Wonderboy’ Thompson in a welterweight scrap. Thompson (14-3-1) will look to bounce back from losing two of his last three fights. His last victory was against Jorge Masvidal at UFC 217 back in November of 2017. As for Pettis (21-8). The 32-year-old has alternated between a win and a loss since defeating Charles Oliveira in August of 2016. A win over “Wonderboy” could rejuvenate “Showtimes” career. The fighters touch gloves. Thompson throws a high kick to start. Pettis moves forward with a high guard. Thompson is using his typical karate style. He lands a sidekick. Pettis is trying to stay in his face as he lands a hard leg kick. They trade kicks as Pettis continues to wade forward. Thompson flicks his foot out into Pettis’ midsection. Pettis throws a spinning head kick that misses. Thompson retreats and lands a leg kick. He flurries some punches together. Pettis lands a right cross. Less than a minute to go. Thompson lands a stiff jab followed by a spin kick. Pettis’ face is busted up as the round ends. Pettis takes the center of the Octagon as Thompson smashes a head kick into his guard. Thompson switches stances and flicks a head kick, Pettis throws one of his own. Thompson is using his sidekick as a jab to keep Pettis at bay thus far. Pettis smashes a backside leg kick. Thompson finds a home for his jab again. Pettis lands an outside low kick. Thompson splits the guard with a straight right hand. Both fighters have relied heavily on their feet this fight. Thompson doubles up the jab and lands a leg kick. He flicks a head kick that clips Pettis. Both men look for the same leg kick at the same time. Thompson quickly lands a jab. From nowhere, Pettis throws a Superman punch and floors Thompson. The fight is over. He pushes off the fence and floored Thompson with a right hand. Unreal.